"LaVO touches on the silent service’s overall strategic picture and on the progress of the war, but he concentrates on giving the reader a sense of what motivated enlisted personnel to join the submarine service and what life in that service was generally like for them. This inclusion is one of the strongest aspects of the book: LaVO’s narration is generally accurate and thoroughly researched based on solid documentation. His reconstruction of events, including quotations of dialog between the crew, is meticulous without losing its "readability" (he includes a "bibliographical essay" in which he cites his sources for specific passages in the text). Another strength is that he examines, with surprising thoroughness, how enlisted personnel trained (officer training is completely absent) at the Navy’s submarine school in New London, Connecticut, how they practiced emergency ascents, and how much of their equipment was designed and operated, such as the McCann Rescue Bell used to rescue stranded survivors from the Squalus. Furthermore, he articulates these things without overwhelming the lay reader in technical language." Fluckey was one of the great naval heroes of World War II. His exploits as captain of the submarine USS Barb revolutionized undersea warfare and laid the groundwork for the nuclear-powered ballistic missile submarine fleet that today is the primary deterrent and capability of the United States against nuclear attack. Now a retired rear admiral living in Annapolis, Maryland, he is the most decorated living American, having earned numerous presidential, congressional, and military honors, including the Medal of Honor and four Navy Crosses. In the war against Japan, Fluckey fired the first ballistic missiles from a submarine, sank more tonnage than any other U.S. submarine skipper; including an aircraft carrier, a cruiser, a destroyer, and blew up a train after landing submariners-turned-saboteurs on mainland Japan in 1945. 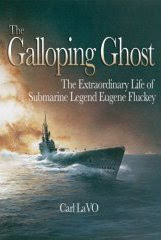 The title of this biography is the legendary submariner s nickname, "Galloping Ghost, " a reference to the hit-and-run tactics that left his enemies baffled about the direction of his attacks. Here is the admiral's story, told with the exclusive access to Admiral Fluckey's personal papers and based on interviews with him, his family, Barb shipmates, official Navy documents, and the recollections of his contemporaries. The author, Carl LaVO, who spent years researching the subject, offers not only a dramatic, action-filled account of Fluckey's wartime experiences, but also a lively description of his life before and after that captures the infectious optimism contributing to his many successes. LaVO describes meeting the ninety-year-old retired admiral: With a full shock of hair, trim build, natty clothes, and buoyant demeanor, Fluckey looked much younger and still displayed his characteristic dry wit, despite the fact that Alzheimer's disease had robbed him of many memories. When asked about a long-forgotten episode of his life, the admiral replied with a twinkle in his eyes and hearty laugh, I don t know. You tell me. LaVO took up his challenge and with this book presents Admiral Fluckey's full biography. Carl LaVO, a graduate of the University of Florida at Gainesville, is the author of Slade Cutter: Submarine Warrior and Back from the Deep: The Strange Story of the Sister Subs Squalus and Sculpin, both published by the Naval Institute Press. He has also written many articles for the Institute's two magazines, Proceedings and Naval History, and a variety of general-interest periodicals. His television appearances include the History Channel series Silent Service and Man, Moment and Machine. An award-winning journalist, LaVO is assistant managing editor of the Courier Times in Bucks County, Pennsylvania, where he lives with his wife Mary Anne. He is an experienced scuba diver and has explored many of the water-filled caverns and subterranean rivers of Florida, exceeding depths of two hundred feet. A childhood interest in the atomic submarine Nautilus and the book Twenty Thousand Leagues under the Sea by Jules Verne gave him a lifelong curiosity about the Silent Service and undersea exploration. "This book depicts Captain Cutter's life very well. The book is not only about his heroic feats as a Captain in WWII, but in other areas of his life as well. In everything Captain Slade Cutter attempted he did it with integrity and passion." Please visit http://www.usni.org/store/item.asp?ITEM_ID=642 to buy a copy of your own. 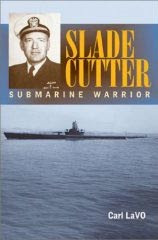 Slade Cutter’s heroic feats as an athlete and World War II submarine commander left an indelible mark on the U.S. Navy. From a humble upbringing on a Depression-era farm in Illinois, he became one of America’s most formidable and decorated officers of the war, earning four Navy Crosses and a Presidential Unit Citation as the commander of a submarine in the Pacific that sank twenty-three ships. His brilliant tactics and unusual exploits are the stuff of legends, yet no biography has been previously published about him. Now, with complete and exclusive access to Cutter, who lives in Annapolis, journalist Carl LaVO presents a remarkably candid portrait of the storied captain. He draws on countless interviews with Cutter and with many of his shipmates and admirers, as well as a few detractors. Cutter’s own views about his naval career and the inner ticking of the Navy’s hierarchy are always forthright and make a unique and memorable contribution to the official record. The biography also pays welcome attention to Cutter’s athletic achievements at the Naval Academy in the 1930s. A charter member of the College Football Hall of Fame, he single-handedly beat Army in 1935 to end a thirteen-year losing streak for the midshipmen. An undefeated collegiate heavyweight boxer often compared with the great Joe Lewis, Cutter says he never regretted turning down an offer to become a professional and vie for the world heavyweight championship. The book offers a parade of colorful figures that played a role in Cutter’s life, from his pre-Annapolis days to his post-war cruise aboard the nation’s first atomic sub, his stint as the Academy’s athletic director, and service as captain of a cruiser in the Bay of Pigs operation in Cuba. LaVO’s honest account of this national hero and Cutter’s own insights into the Navy of the mid-twentieth century make exciting reading for a broad range of readers. Please feel free to post reviews!